U.S. Sees More Female Farmers Cropping Up Since 2002, there's been a 30 percent increase in female-run farms across the country. Whether it's because they're interested in growing sustainable food, making a side income or contributing to the local food movement, they've brought the total up to about 300,000 farms run by women. Helen Gunderson sits with her chickens by their "summer home" coop in her garden. The eggs are for her personal use, but Gunderson is a farmer by trade, managing 180 acres of her own land in Rolfe, Iowa. The old farmer stereotype of a white guy in overalls has at least one truth to it: The majority of farmers in the U.S. are white males. Yet a growing number of women are joining their ranks. Women now run about 14 percent of the nation's farms, up from only 5 percent in the 1980s. Most female-run farms tend to be smaller and more diverse, and many are part of the burgeoning organic and local foods movement. Women have long been involved in agriculture, but even just a generation ago, it was harder for women to take leadership roles on the farm. "Girls could grow up to be farmers' wives, but for a woman to actually consider herself to be farmer or grow up to be farmer, that wasn't in the script," says Helen Gunderson, who grew up in a farming family in northern Iowa. 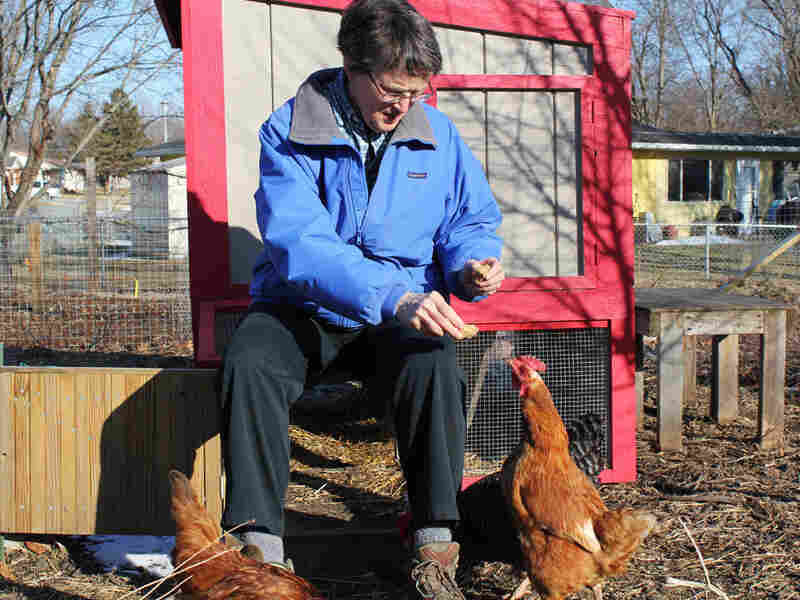 Now Gunderson lives in a one-story white ranch house in a quiet neighborhood in Ames, and she has turned her half-acre yard into a garden and chicken run. Gunderson always wanted to be a farmer. She grew up in Rolfe, Iowa, where her family farmed large tracts of corn and soybeans. As a kid she resented that her brother, Charles, the only boy in the family, was trained to take over the family business. "He was the one groomed to make decisions about farming. He had more significant farm projects. I had chickens; he had cattle. He had a 40-acre field project," says Gunderson. Girls could grow up to be farmers' wives, but for women to actually consider herself to be farmer or grow up to be farmer, that wasn't in the script. "And I said something to the effect that someday, someday in the future, I would like to manage my own land. And [Charles] just right away said, 'Well, we can start now.' "
Her father — who has since died — took a bit more convincing. She still remembers the day they met at his farm, and sat down together at the round oak table in the kitchen. Gunderson says she brought up her great-grandmother Dena as an example to show her father a woman who would have been good at managing a farm. "He said, 'Oh, yes, Dena would have been really good.' So I pointed out other examples from our heritage, so soon he softened up," Gunderson says. "I hadn't planned to tell him how much I resented the favoritism he gave to Charles, in terms of grooming him to make farm decisions, but at the end of the conversation, I told him. And it was surprising, because he said it didn't surprise him, and he could understand." With her father's blessing and her brother's help, Gunderson took over managing her acreage. She made spreadsheets, followed soybean and corn prices, and managed the farmers who rent out her land. The more Gunderson got involved, the more she wanted to make some changes she felt would make her farm more sustainable. Then, three years ago, one of her farmers wasn't working out. That's when she thought of the girl next door. "And over the years I realized that Betsy was actually planting corn and combining beans, and doing things that my father always thought of as men's work." 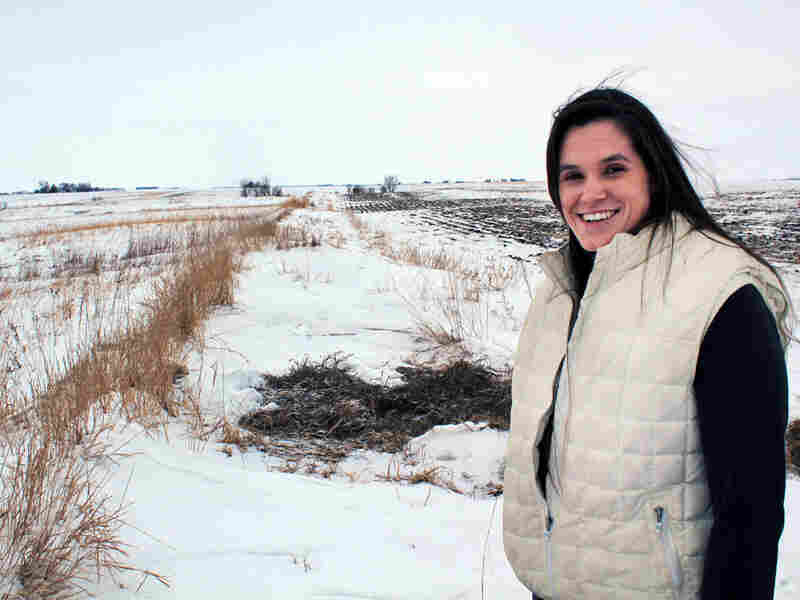 Gunderson asked Betsy Dahl, 30, to farm about 180 acres of her land. The Dahl family lives in Gunderson's childhood town, and the two families have known each other for generations. This is the first time Dahl has farmed on her own. She's responsible for everything from ordering seed and planting to harvesting and marketing. But it's not her first time driving farm equipment; she began by helping out her father as a kid. "I'd haul in grain to farms, unload, get augers fixed, which I got good at too," says Dahl. "I did a lot of the repairs — he'd show me, I'd see it and maybe one more time I could do it myself." Dahl is one of a growing number of young women getting into farming. Just since 2002, there's been a 30 percent increase in the number of female-run farms, says Leigh Adcock, the director of the Women Food and Agriculture Network, a national group supporting women farmers and sustainable farming. "By far the biggest percentage of that increase is women with small acreages, making not a whole lot of money, but making some money from agriculture, and often raising food or livestock for food," Adcock says. "I mean they're not getting into farming to run quarter-million-dollar combines; they're out there raising food." Across the country, women run more than 300,000 farms. They're more likely to raise livestock and grow vegetables than to farm row after row of corn and soybeans. Dahl gives a lot of credit to her father, who she says trusted and encouraged her and included her in all aspects of farming. "Yeah, and I've talked to others and it's like, 'Aw, what, your dad lets you go out and plant and cultivate? My dad wouldn't let me go in field after crops were up,' " Dahl says. More women are taking leadership roles in agriculture for a variety of reasons — from an interest in growing sustainable food to making a side income by contributing to the burgeoning local food movement. And for some it's just something they've always wanted to do. Kathleen Masterson reports from Iowa for Harvest Public Media, an agriculture-reporting project involving six NPR member stations in the Midwest. To read more about female farmers, click here. For more stories about farm and food, check out harvestpublicmedia.org.